The eighties ushered in a new era of hi tech toys – everything had to be battery operated and preferably look like some form of computer. The ‘silicon chip’ beloved of Tomorrow’s World reigned supreme over the eighties toy box, and it was a time when parents had to remember to buy in extra batteries at Christmas or there would be tears. Starting off in the very early eighties was the non-battery powered but fiendishly addictive Rubik’s Cube, still an icon of the eighties. 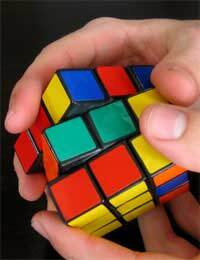 Developed by Professor Rubik, the puzzle drove many a child mad as they tried to solve it using mathematical logic, perseverance, or in some cases, brute force and a hammer. Following on from the cube was a pyramid and even a snake, but none of these were as hard to solve as the original puzzle. For little girls, who loved their dollies, the coveted toy of the eighties was quite possibly the Cabbage Patch Kid. Charmingly named cloth dolls with vinyl faces, the Cabbage Patch Kids had strange looking faces and weren’t as cute as the average doll. However, despite urban myths that they were created to desensitise children to the appearance of mutated children, born after a nuclear war (well, it was the eighties) they created havoc and stampedes at toy shops, probably becoming the first toy to inspire this kind of consumer mayhem. Every child of the eighties wanted the ‘it toy’ – the Atari Space Invaders console. The excitement of owning your very own Space Invaders mini arcade game and being able to argue over whose turn it was to play said game was indescribable. Pac Man was also popular, with the home version becoming available pocket size in the early eighties, very basic graphics and an unforgettable noise when the little round fella got caught by a pesky ghost. Archaic Pac Man may be when we compare it to the sophistication of a Play station or X Box, but back in the day, they were the height of toy sophistication and much sought after. The eighties set the scene for the toy mania of the nineties, and took merchandising to a whole new level.